Your fridge holds many easily accessible high carbohydrate items that can be replaced with Easy Lo-Carb alternatives. Generally if the fat has been reduced or lowered that will increase the percentage of sugar/carbohydrate. Sometimes food manufacturers will even add sugar to increase the flavour lost from removing fat – because in the Low-Fat world, Sugar is just non-fattening calories, Right? Beware of sausages, rissoles and pre-made burgers as producers often use breads and starches to bulk or stabilise the meat for longer shelf life – I get the sausages from my butcher who only uses the fat he trims off everyone else’s meat to bulk out his – which is fine by me! As with everything, there are always exceptions to these rules, check ingredients lists and carb counts. There are some higher carb items we keep as “special treats” and only eat when we have had a particularly low carb day. Low fat yogurts, sour creams Buy the full fat versions, we have found that coconut yogurt is delicious – but really expensive for a small pot – but we have a cunning plan to allow you to make it at about 1/6 of the price….details soon. Reduced fat cheeses Buy the good stuff – don’t compromise on flavour. I like to keep a good strong cheddar along with a small soft cheese. This Flaxseed (linseed) cracker recipe is great with cheese. Tomato, Barbecue and sweet chilli sauces These all have sugar added, but good news there are more and more sugar free versions coming on the market. Here In Australia Fountain have a couple of different version of all three, Rosella has a no added sugar tomato sauce. In the UK & US Heinz has a reduced sugar version, but I haven’t seen it here in Australia. Fruit Juices Biochemically a piece of Fruit is essentially a bag of flavoured sugar water packaged in fibre. Juice simply removes the fibre (which is at least is good for your intestinal biome). What few micronutrients are available in fruit you can get in better quantities from eating things like Capsicum and kale both of which for example are higher in Vitamin C than citrus. Have cold water with a splash of fresh lemon or lime juice and if needed a bit of your favourite non-sugar sweetener. Full sugar drinks Ditch the sodas and soft drinks that contain mountains of sugar. We use sodastream diet and sugar free syrups for replacements, but the sweeteners are not for everyone. So try naturally flavoured mineral waters (make sure they don’t have sugar added- I found Schweppes naturally infused mineral waters) or sugar free iced teas (or make your own) – why not make your own iced coffee with some whipped cream. Packaged meals The replacement for this is to make your own meals. I had a look through what was available at the supermarkets here (not frozen meals) and everything was served with pasta, potato, rice or pastry. With a bit of planning you can have meals ready in only minutes – we have pre-portioned amounts of slow cooked beef in the freezer. We leave some out in the morning, by dinner time, we heat a pan with some beef fat, add the meat add a spoonful or so of our favourite curry paste its done in less than 10 minutes, while its heating, put some cauliflower in the food processor until the pieces are the size of rice grains, put in microwave container cover with hot water and cook in micro for 3 minutes – you now have curry and rice in less than 10 minutes all up. Pre-made desserts Unless it is sugar free (and there are not that many of them) – Ditch em – make your own, have some yogurt (coconut yogurt is great). Pastries, cookie dough’s, pre-made fresh pasta and noodles These are all made with high carbohydrate grains or refined sugars and so are no good for you. For pastry, try using almond meal based substitute (260g Almond meal, 1 egg, pinch salt and 2 tbls of coconut oil – process and voila – press into dish/pan etc) For pastas see the pantry entry for lo carb versions, konjac substitute or zucchini/squash substitutes. For cookie dough – we will be working on that..
Left overs If you cooked it before you went Lo-Carb and you can’t remember the ingredients or if it has become an interesting science experiment, then ditch, especially in the early days. If you are starting off with a 20g per day carb count, you can’t risk it. Later on your body can probably withstand some “garbage carbage” but better to start of anew. Anything else Low Fat Full fat version ! If sugar is in the top ingredients of a product, then give it a miss, if you are cleaning out your fridge then ditch these items. If the carb count is more than 20g per serving (and this may depend on your individual carb tolerance) then it gets ditched – actually unless it is something we absolutely love, probably even less. But remember always to base this on YOUR serving size not their recommended as we find these are often wrong for us. This is just a quick guide – there will also be exemptions. Sauces and pastes We use a few curry pastes for quick and easy meals, so be sure to check what you have already, we found green curry pastes with carbs ranging from 6% to 24% with the higher end having added sugar and the lower end not. Another example is Oyster sauce – most are about 30% added sugar as the second ingredient, but Changs is about half the carbs with sugar further down its list. Fruit Keep the berries (blueberries, strawberries, raspberries and blackberries) and rhubarb. For other fruits you need to check the carbohydrate counts for them, bananas, mangos grapes and cherries are all really high. Replace with low carb veggies such as capsicum, green leafy veggies. Alternatively you can get flavours (sugar free) to add to drinks and deserts. Pickles Some pickles use sugar with the pickling agent (usually vinegar). Here in Australia Three Threes brand have standard pickled onions with added sugar where the carb count is 17% and a “old style” version that is less than 5% carbs with no added sugar – guess which one I recommend..!So be careful and check the labels and ingredients. Sausages Make sure that they don’t have “fillers”. Your sausages should be filled with meat, fat, some veggies or cheese and herbs and spices. Check the ingredients for bread crumbs, starches (rice, corn or potato), thickeners or added sugar. Spreads and dips This will depend on the flavour – some of the nut and herb ones are not too bad if you don’t eat too much of them, as are the avocado based dips – hummus is usually a bit high but check, I like using these with cheese on the flax crackers as I can’t have quince paste any more. Pre-packaged salads With these, there may be just bits not to use, generally a Caesar salad has croutons, just remove these and the other bits are usually ok. I add nuts as a substitute for the crunch. For pre-dressed salads, just check the carb counts and ingredients as the dressings can have sugar. Some use the oil as a preservative which works well for keto. Tofu Check if there are any sauces or marinades etc that increase the carb content. Tofu does have some carbs but if it fits within your daily carb limit you can still eat it – but just be aware. Alcohol Steer clear of liqueurs and premixes. Vodka and rum are usually low in carbs – but keep in mind that Alcohol is still calories, and while you have any in your system you metabolize that first and your body puts ketosis on hold. If you drink every day then your brain may not get enough Ketones for normal activity, and you may suffer urgent cravings for immediate energy (Sugar). 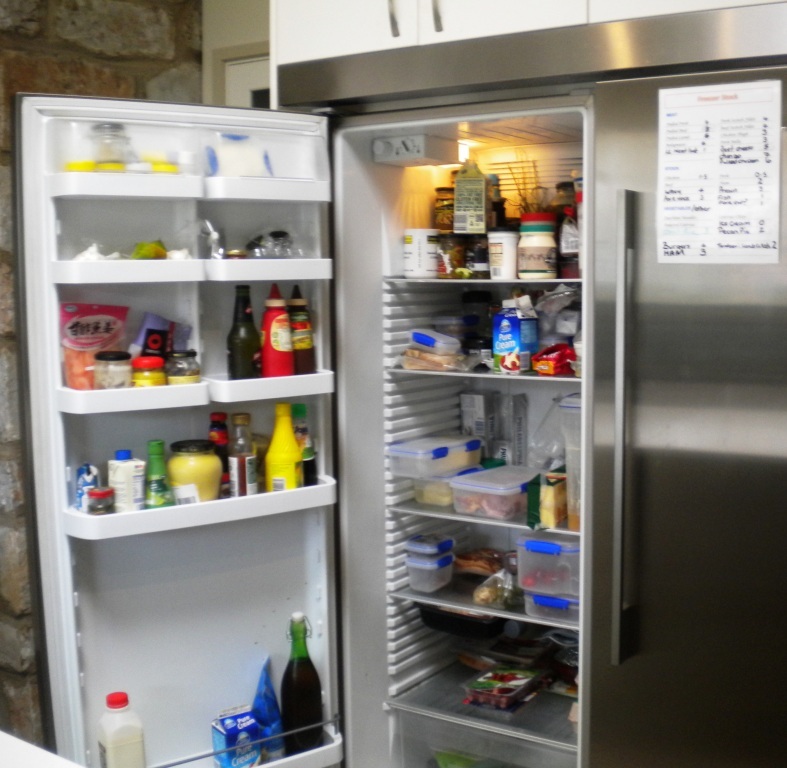 When we went Lo-Carb we found a lot of our Fridge items were already perfectly fine – but you should still check them all. Full fat cream, milk, cheese and other dairy products Because fat is what your body is now going to thrive on. The fats in these products are animal saturated fat (for the most part) and the basis of the fuel your body is now using. Bacon Because you can – and remember everything tastes better with bacon! Vegetables We use most veggies, especially the salad items, although not in the same volume as non-keto. This is not just due to the ketogenic diet but also the fact we just don’t eat as much. Raw plain meat and fish Don’t cut the fat off – enjoy lots of these, try and get grass feed beef and pork (lamb is only grass) and wild fish. Eggs Natures little package of goodness, we use lots and lots of eggs. Try to find proper free range eggs. The eggs have better nutrients the better the chickens are fed, and they normally feed on grubs and seeds in the top soil. Flavourings Garlic, Ginger, Galangal etc. These including fresh herbs are great for adding flavour to meats and veggies. In the small quantities that are needed they create variety and interest. Butter Make it the real stuff, we make our own. OK So these things are foods we had previously tried to avoid while following the prudent low fat diet. Things like Lard. Who has Lard in their fridge these days – well we do now. Extra Cream Well we do – we use it to make our own ice cream, butter, sour cream and use it in coffee drinks and over deserts. We also use it in cooking as well – a tablespoon or so in the omelette etc. We have pure pouring cream as well as a naturally thick cream. Extra Eggs We use omelettes as wraps or tortillas , we use eggs in ice cream, salads, as a thickener in bread substitutes. I always try to buy free range, but there is still debate about how labelling occurs here is Australia. Where possible, I buy the local free range from our independent fruit and veg shop – they usually still have feathers on them!. Pate Richard cannot stand this stuff and it can be an acquired taste, but it is one of my little pleasures. It is made from liver, and I believe is a little easier to stomach than a piece of liver, it goes well with the flax seed crackers or on a piece of low carb bread toast. Chicken (preferably with skin on) In the early days when we were eating less than 20g carbs per day, we would cook up a load of chicken and cut into chunks and have it for snacks in the fridge, it works quite well, only it is difficult to find breast or thigh with skin on. 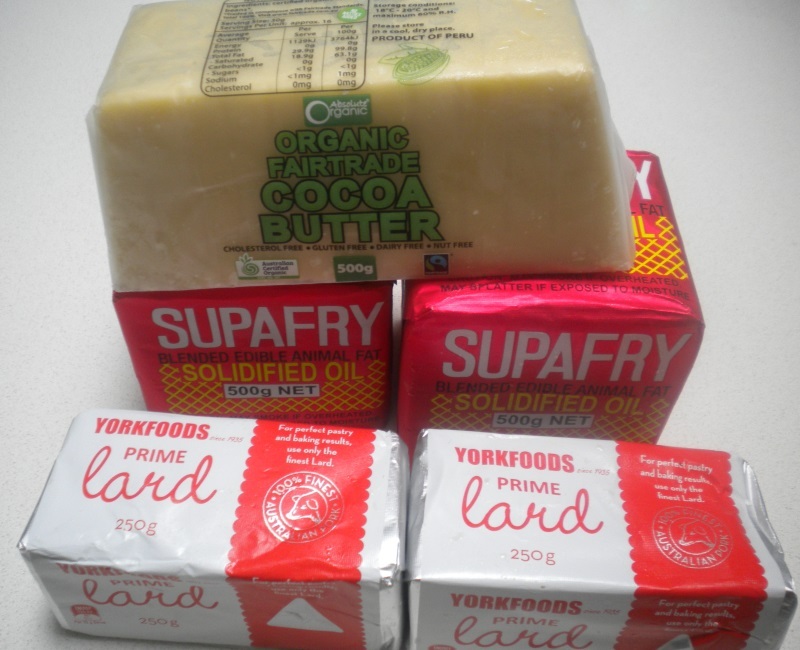 More Fats We buy blocks of Lard (pork fat), dripping or Tallow (beef fat) duck fat or any other animal fat that we see. The different ones are used to add additional fat to leaner cuts of meat or to add when cooking anything, vegetables, etc.